Swooning over fast fashion? The low prices aren’t the only thing making people feel light-headed. Dozens of human-rights activists are staging flash “faint-ins” at high-street retailers across Europe to illustrate the high incidence of mass fainting in Cambodia’s apparel factories. Protestors from the Clean Clothes Campaign, an alliance of organizations in 15 European countries dedicated to improving working conditions in the global garment and sportswear industries, collapsed on the floors of H&M, Gap, Levi’s, and Zara stores in London, Warsaw, Copenhagen, and Paris on Wednesday to highlight the effects of poverty pay, malnutrition, and unsafe workplace conditions endemic to the Southeast Asian nation. Paying living wages is “not a choice, it’s a pressing necessity,” says the Clean Clothes Campaign. In 2011 alone, more than 2,400 workers in 25 separate incidences were admitted to hospital after fainting from hunger or exhaustion, according to the group. Unions say many more go unrecorded. Over 90 percent of Cambodian garment workers are women, aged between 18 and 35. Despite rising costs of food, housing, clothing, education, transport, and healthcare, the monthly minimum wage remains at $61. (Clean Clothes Campaign says a “living wage” that covers basic needs is more than four times this amount.) Calorie research carried out by the Workers’ Rights Consortium earlier in the year found that workers in Cambodia consistently face a calorie deficit of over 500 kcal a day on a lifestyle dominated by physical labor. Workers who were interviewed affirmed that the food they can afford isn’t nutritious or enough to sustain them. Research shows that Cambodian workers face a calorie deficit of over 500 kcal a day on a lifestyle dominated by physical labor. Rom Sokha, who works at Yung Wah Industrial Co., a Singaporean-owned factory that manufactures shirts, jackets, and pants for Gap, Old Navy, and Banana Republic, is only 33 years old but already suffers from serious stomach, colon, and heart problems. Swooning over fast fashion? The low prices aren't the only thing making people feel light-headed. 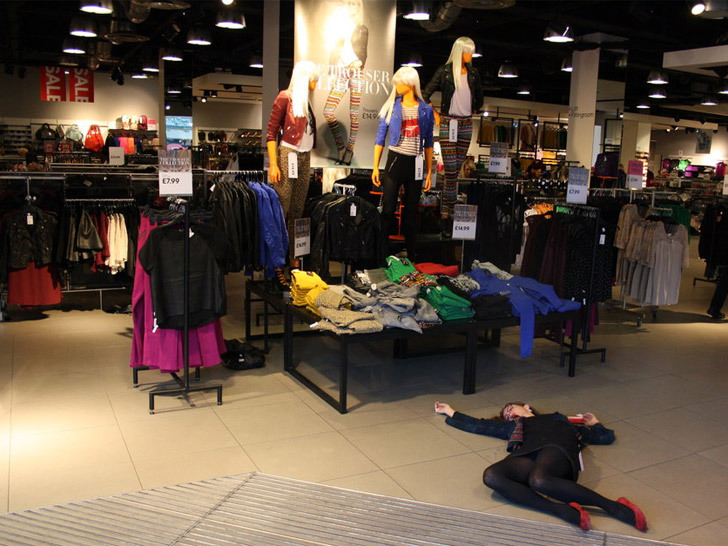 Dozens of human-rights activists are staging flash "faint-ins" at high-street retailers across Europe to illustrate the high incidence of mass fainting in Cambodia's apparel factories. Protestors from the Clean Clothes Campaign, an alliance of organizations in 15 European countries dedicated to improving working conditions in the global garment and sportswear industries, collapsed on the floors of H&M, Gap, Levi's, and Zara stores in London, Warsaw, Copenhagen, and Paris on Wednesday to highlight the effects of poverty pay, malnutrition, and unsafe workplace conditions endemic to the Southeast Asian nation.